Cheryl Esposito welcomes Dr. Ken Druck, author, speaker, & coach, and a lifeline to thousands of individuals, families, communities & organizations he’s helped through tragic loss. He wrote The Real Rules of Life: Balancing Life’s Terms with Your Own; & just released, Courageous Aging: Your Best Years Ever Reimagined. Ken knows courage. His journey through tragedy after the death of his daughter Jenna led him to discover how we survive life’s worst losses & uncover its gifts. He committed to helping others navigate their own losses, giving his all. Loss takes many forms. Some not tragic, but devastating to one’s spirit. Aging in the western world is couched in the language of loss – of youth, looks, health, relevancy & more. “Successful aging takes courage. 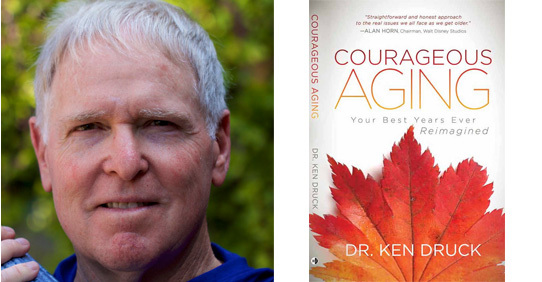 What’s deeply important to the process of courageous aging is that you set the terms for yourself.” Join Cheryl Esposito & Dr. Ken Druck for your roadmap to courageous aging and courageous living at every age!